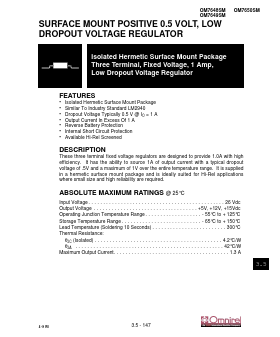 These three terminal fixed voltage regulators are designed to provide 1.0A with high efficiency. It has the ability to source 1A of output current with a typical dropout voltage of .5V and a maximum of 1V over the entire temperature range. It is supplied in a hermetic surface mount package and is ideally suited for Hi-Rel applications where small size and high reliability are required.